Prof. Joshua B. Nelson, a citizen of the Cherokee Nation and a native Oklahoman, is an associate professor of English and an affiliated faculty member with Film & Media Studies and Native American Studies, focusing on American Indian literature and film. His book, Progressive Traditions: Identity in Cherokee Literature and Culture, looks to dismantle the pervasive assimilated/traditional dichotomy plaguing American Indian literary criticism. It explores the empowering potential of traditional, adaptive strategies and practices to address cultural and historical dilemmas. Prof. Nelson takes a pluralist interest in tribalist, postcolonial, anarchistic, feminist, and pragmatic theoretical perspectives. 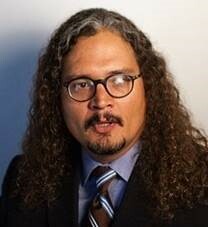 His work has appeared in the American Indian Culture and Research Journal, TheOxford Handbook of Indigenous American Literature, and The Wiley-Blackwell Companion to Film Comedy. He is at work on a book on representations of the body in Indigenous film. He teaches courses on American Indian literature, literary criticism, and film. He and his wife divide their time between Norman and Park Hill, Oklahoma. Ronnie Bo Dean is a larger-than-life outlaw with a short fuse and probably some loose screws. Uncouth and suffering from a mean hangover, he struggles to babysit his jailed neighbor’s precocious kids.